In fairness, Ryan’s article makes three very good points. First, the term “crowdfunding” is confusing. The term conflates two very different activities: rewards-based or charitable crowdfunding sites (Kickstarter, GoFundMe, or Indiegogo) and investment crowdfunding sites (AngelList, EquityNet, SeedInvest, FundersClub, and others). Ryan is absolutely correct. These are different animals. The two categories operate under very different regulatory regimes and should not be confused. A distinct label is needed for each. Second, marketplace models work. Using technology to efficiently disintermediate middlemen and connect multiple suppliers and consumers creates value. Online marketplaces reduce friction, keep overhead low, and reduce information asymmetry. Examples are plentiful. Third, “hybrid” platforms combine the best of both worlds. By “hybrid” platforms, I mean the kinds of platforms Ryan touts, specifically funding platforms on which companies can access both retail investor capital and institutional capital on a single platform. Ryan's company, CircleUp is a hybrid platform focused on funding consumer goods companies. My company, StreetShares, is also a hybrid model, in which institutional and retail investors come together to back lower-cost loans to small businesses, particularly veteran business loans. Hybrids are awesome. They combine the reliability of institutional capital with the social stickiness and product feedback benefits of retail investor capital. But these three points do not mean that investment crowdfunding is dead. It just means investment crowdfunding isn’t right for everyone. And that’s okay. There’s a universe of companies out there who will never receive funding from professional venture capitalists (VC) or angel investors. Period. It doesn’t matter if the professional investor is operating out of a costly Sand Hill Road office space in Silicon Valley or a hybrid online platform. Professional investors have specific (often narrow) investment theses, performance requirements, and (dare I say it) groupthink. Professional investors on a hybrid platform carry these same biases. Many hybrid platforms require a professional investor to invest (or lead an investment) alongside retail investors. If the VC isn’t in, the deal will not get done. There are thousands of companies that need an alternative. Pure investment crowdfunding remains that alternative. 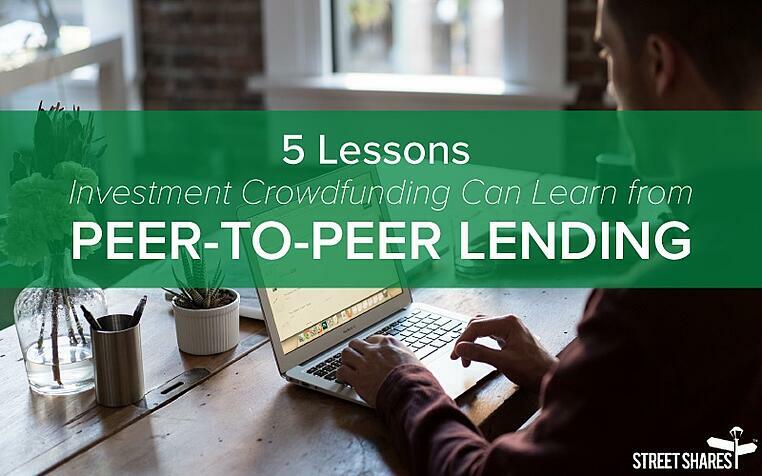 Peer-to-peer lending began in 2005 as essentially crowdfunding loans from individual retail investors. This was a pure crowdfunding model. Peer-to-peer lending grew moderately in a regulatory vacuum until the vanguard platforms (Lending Club and Prosper) tangled with the Securities and Exchange Commission (SEC) in 2008-2009. Both platforms shut down temporarily, met with their lawyers, and emerged with the same restructured format that allowed for public registration of their securities and SEC oversight of their activities. This entanglement forced maturity on the nascent industry. The SEC was satisfied, an initial regulatory framework was established, and the industry grew rapidly over the years that followed. Only after the regulatory regime was settled did peer-to-peer lending take off at a breakneck pace. At the moment, the regulatory environment is unsettled for investment crowdfunding. And that will slow the industry’s growth. Yes, Title III of the JOBS Act is newly in effect, but the practical regulation of new Title III platforms is not settled. Practical regulatory settling only occurs when we have a few interactions between industry and regulators and a pattern of expected conduct is established for both sides. Like its older cousin, investment crowdfunding will find its regulatory groove. When it does, real growth can occur. I’m a military veteran. And as any military veteran will tell you: names and labels have meaning, but the true reality is determined by what is actually happening on the ground. The industry’s desire for a more inclusive label that also included large “balance sheet” funding platforms that didn’t use retail investors at all. In short, there was more “Wall Street” and less “peer” in peer-to-peer lending, and a new name was needed. Ryan Caldbeck’s article on why crowdfunding is dead advocates the use of a similar new term—"marketplace investing"—to replace the term “investment crowdfunding.” Ryan points out that single portal access to both institutional and retail/crowd capital (“hybrid” platforms like CircleUp and StreetShares) will make pure crowdfunding platforms obsolete, and being able to access multiple capital sources through a single platform is preferable. As a result, a similar renaming is needed according to Ryan (and others). This logic tracks that of the 2014 peer-turned-marketplace lenders. More institutional capital + less retail capital = new name. This is probably true, but here’s the irony: the reality on the ground is that marketplace lenders are reversing course. The marketplace lending industry of 2016 has learned how fickle Wall Street institutional capital can be. Lending platforms are worried about funding drying up. Marketplace lending has learned that funding platforms need as many funding sources as possible: big funds, small funds, high-net-worth individuals, and retail investors. The corollary of Lesson 3 is that retail investors are an important part of “marketplace” financing of all forms. The high costs and fickle nature of Wall Street and institutional funds means that marketplace lenders are now moving back to a more peer-to-peer-focused approach. In other words, “pure” debt crowdfunding is making a comeback, and many in the industry are putting the “peer” back in peer-to-peer. Certainly, accessing retail investors has its downsides for any platform – primarily the additional (and appropriate) regulatory burdens that come with accessing public investor capital. But in many cases, the benefits of including retail investors are worth the regulatory burden. Our platform, StreetShares, is a good example of this. We use technology that connects retail investors and borrowers (our suppliers and business owners) by a shared social group (e.g., military veterans funding loans to other military veterans). This technology reduces our costs to lend, reduces risks, and allows StreetShares to make veteran small business loans more affordable than any other lender in the country. This social lending approach would not be possible without a healthy dose of “peer” retail investors. The last lesson is a cautionary tale. If you’re watching your older cousin, take note when he/she gets in trouble. If your older cousin gets caught sneaking in drunk one night, mom and dad are bound to respond, and family trust will be damaged. Don’t repeat the same failure. The emerging peer-to-peer/marketplace lending industry had a difficult season in spring of 2016. Within a single week, three bits of bad news hit the papers: Lending Club’s CEO resigned over alleged internal fraud; Prosper laid off 28 percent of its workforce; and a few public platforms experienced tumbling stock prices. In short, the industry’s biggest leader made a huge mistake, and everyone saw it. It reeked, and it was embarrassing. It created problems and suspicions for those who never engaged in any misbehavior. The public and regulators took note and began to respond. The sustainability of the industry’s growth. Nascent industries can be young and immature. Either they learn self-control or external forces will exert more control over them. Importantly, none of these mistakes changed the underlying need for the services marketplace lenders provides. Recall Lesson 1: if you’re solving a market need, everything else will work out. Individuals and small businesses need the loans that marketplace lenders provide. As a result, as expected, the industry is making a comeback. It recovered from the hangover, sat down with mom and dad for a talk, and is implementing steps to make sure it won’t happen again. The mistakes made so far are not fatal, but it takes time to earn back mom and dad’s trust. The emerging investment crowdfunding industry would do well to remember this. At StreetShares, we take all of this into consideration. We care about our investors and small business owners and are passionate about staying current with regulatory affairs and ensuring sustainable growth for our investors and borrowers. StreetShares brings institutional and retail investors together to fund business loans and help grow American small businesses, particularly veteran-run businesses. Though technology that reduces our costs to lend and reduces risks, we’re more affordable than any other lender in the country. Stay up to date with the ever-changing industry of investing, peer-to-peer/marketplace lending and borrowing and stories about our small business customers. Subscribe to our blog.